Last Monday, it snowed. I've been a bit surprised at how little snow we've had since moving here, and I'm beginning to think we won't have a white Christmas. But last week, it snowed. We had some come down here at the house we are renting, and even more at the house we bought. Photo: A blanket of snow covers the front yard of my new house. 1. I'm thankful for the beauty of the snow. 2. I'm thankful that, at least this time, the driveway and roads remained clear. 3. I'm thankful for quail, and I'm happy that large numbers of them frequent both the yard of the house I'm in now, and the yard of the house I'm moving into. 4. 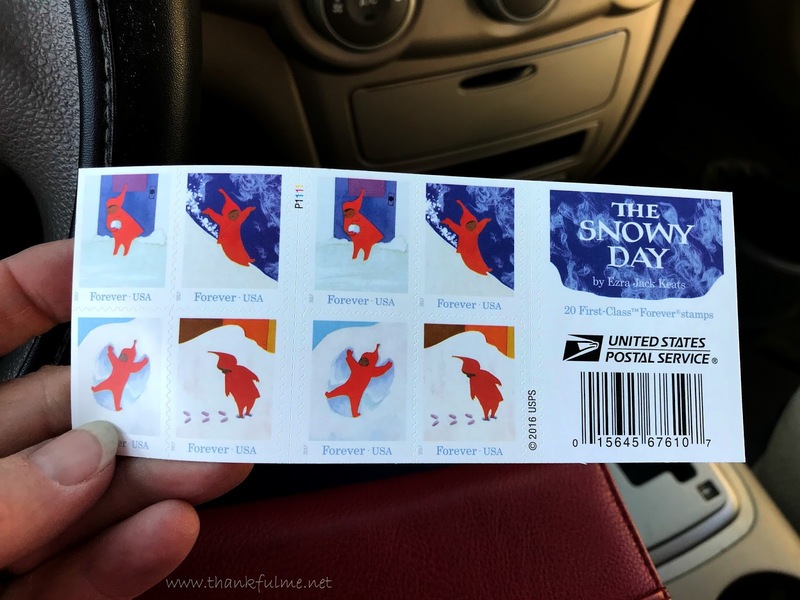 I'm thankful for Snowy Day stamps. When I asked the postal worker what Christmas stamps were available, I didn't even listen past, "Snowy Day." I was instantly transported back to childhood and knew I would be purchasing those stamps. 5. I'm thankful for a Relief Society progressive dinner. It was nice to get to know the women in the ward better. 6. I'm thankful for a phone call from a friend. I need to be better about calling friends; I always enjoy talking with them, but am not very good about initiating the calls. 7. I'm thankful that the plans for the house are starting to fall into place. I've been a little bit stressed trying to coordinate what needs to be done, but hopefully things will be sorted out over the next couple of days. We are planning on remodeling the kitchen (which involves removing cabinets and a closet pantry, moving electrical, and installing a gas line), painting practically the entire interior of the house, replacing carpet, installing some hardwood floors, and refinishing the existing hardwoods. Everyone I talk to tells me what needs to be done before their part of the job can start. I've struggled to keep the choreography of this dance straight in my mind, but I think I'm finally getting it! 8. I'm thankful for this time of year, when I think back over the years and remember friends and family. So many people have touched my life, and I am thankful for them. 9. I'm thankful that age brings with it greater self-awareness and self-assurance. Over the years, I've realized more specifically what I like. 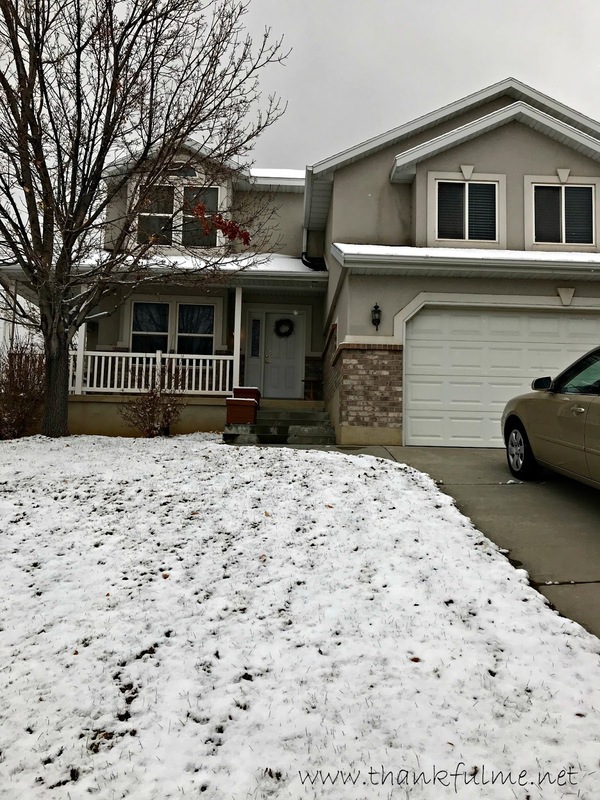 For example, I love houses that have well-defined yards. It doesn't much matter whether the yard has a fence or a hedge around it; if it has some border of some sort, it will catch my eye. Last year, I realized that I am attracted to Christmas trees that have decorative "fluff" stuck in the branches. I decided to get some floral picks to put in my tree. The result wasn't quite what I envisioned, but I still like it, and it makes me laugh, so I'm keeping it. Photo: A Facebook post I wrote: When I bought a silvery, glittery, "Blooming Holiday Bush" at Joann's today, I thought I would separate the individual spirals and put them on my Christmas tree to add a touch of elegance. Instead, when I look at my tree, I think, "It looks like I murdered a slinky and hung the pieces as a trophy." I should know better than to try to adopt elegance into my life. I'm just not that kind of girl--and that's OK.
10. I'm thankful for John, and thankful he loves awkward-Christmas-tree-decorator me. I'm linking this post up late, but that is one beauty of the Ten Things of Thankful blog hop--it's open more days each week than it's closed! Feel free to join us; we love to have new friends participate! I love the Slinky comment with the photo - too funny. You're blessed to have a place to live while the remodeling is being done. I know you'll get the choreography timed perfectly. Thank you for your confidence. I am also glad to not have to live in a construction zone. I love that, number four. I love that phrase, blanket of snow, but am unfamiliar with the book. Will have to check that one out. Thanks. I recently wrote a story about a slinky. Thanks for the photos. Christmas memories from the past include a slinky. I am glad for your final thankful, always but especially this one. The Snowy Day is a picture book about a little boy who plays in the snow. It's a very simple, sweet story, with illustrations to match. He wears a red coat and pants; I seem to remember that you especially like the color red. Looks like a good, manageable amount of sidewalk and driveway, snow shoveling-wise. I would imagine that the local services are geared towards dealing with snow. Sounds like a big project (the remodel) but how much fun it will be when you're done and you move into your new...new house. Yes, I think the cities here are well-equipped to handle snow. Fortunately, our driveway faces south. We still have a little bit of residual snow in our backyard, but the front (including the driveway) is clear. I'm very much looking forward to the end result with the house. We plan on being here a while, and so are making lots of changes just because we want to enjoy them. I'll post before and after photos as the process progresses. Very nice list. Your home is beautiful. Not much elegance here, either, and i love that line about a slinky trophy. Good luck with the remodel! I loved reading the Ezra Jack Keats books and the illustrations. They were so great for reading to groups of preschool kids! Those stamps are cute. I don't think our little post office had those the last time I bought stamps. I looked on usps.com and realized that there are also stamps celebrating Christmas carols. I probably would have bought some of those, too, if I had taken the time to really look at my choices. I was just so thrilled with The Snowy Day stamps!